It’s been on top of my list of the things I’ve always wanted to do, and I’ve been looking for a yoga retreat, that suits my budget, for a looong time. So at the beginning of this year, I just hit the “book it now” button as part of my “Don’t do List” 2015 New Year’s resolutions. It was time to indulge and to be good to myself. 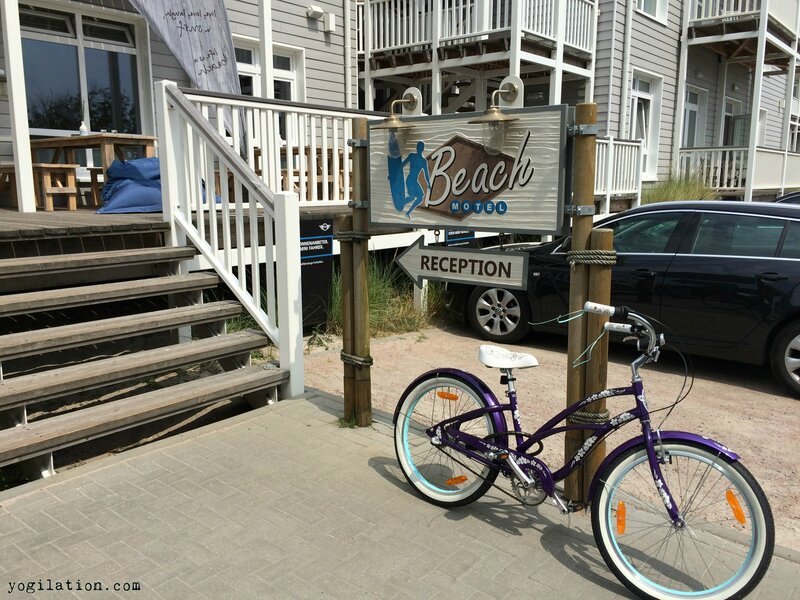 And now the day was here: I packed my yoga mat, clothes, and a big dose of excitement for my little 3-day Yoga Retreat adventure at a cool Beach Motel in beautiful St. Peter-Ording in Germany’s North Frisia. Frankly, I wasn’t too sure what to expect. I haven’t personally met the two yoga teachers /hosts and had no clue what they were like or what their teaching style was going to be. 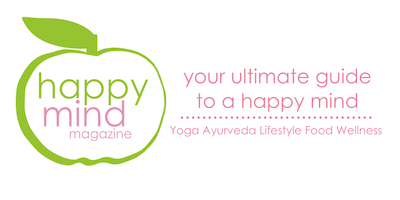 One of the hosts was Christina, the Founder / Owner of Happy Mind Magazine, an awesome online German yoga, Ayurveda, lifestyle and food magazine (based in Hamburg) for which I’m frequently writing for, so I knew her, but only via email. The other host was Nadine, founder and owner of “Damn Good Yoga,” a cool and new yoga studio in Hamburg, but I had not met her either. Was I really ready and OPEN for this? The timing for a Yoga retreat couldn’t have been more interesting: for about the last 2 months, I’ve been going through a “not-so-sure-about-yoga-is-for-me-anymore” phase. My yoga practice has been almost entirely on my own in my apartment for the past 3 years, and I’ve started to experience doubts and a small battle between my mind and my body, finding myself practicing less yoga due to difficulties with my breathing and not seeming to get the relaxation out of it anymore as I used to. So here I was: torn between excitement, fear, and curiosity, as well as my urge to explore and to go on adventures. After about 5 hours of driving, I’ve arrived at the Beach Motel very close to the beach in St. Peter-Ording, which was our venue for the yoga retreat. The motel was super! I was impressed and more than positively surprised!! The staff was very nice, the style and interior design of the whole place was pretty authentic, like being in California at a beach house, ready to hit the water and go surfing. 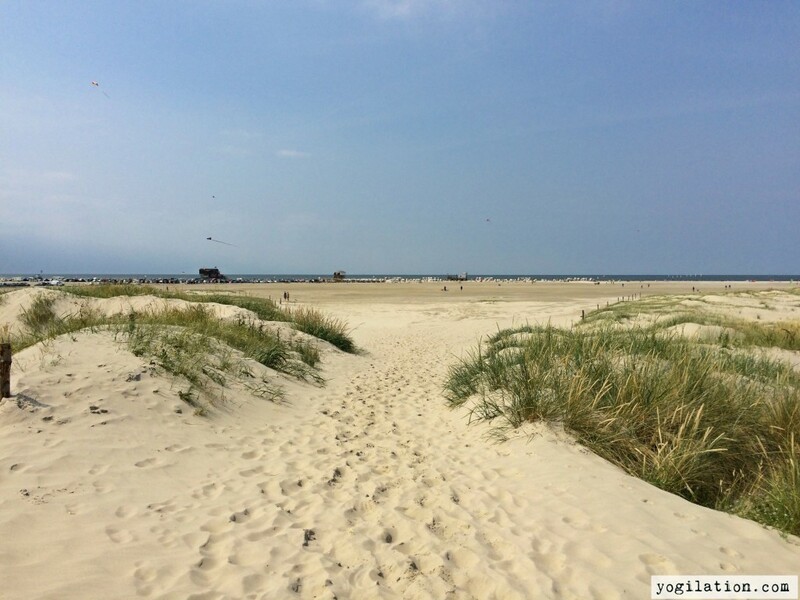 St. Peter-Ording is actually known for it’s wide beach with clean and white sand, as well as for kite-surfing and surfing because they have perfect wind up there. I’ve lived in California for a little while back in 2005 and I also did an internship at a big hotel there, so I can definitely say that the Beach Motel was authentic! 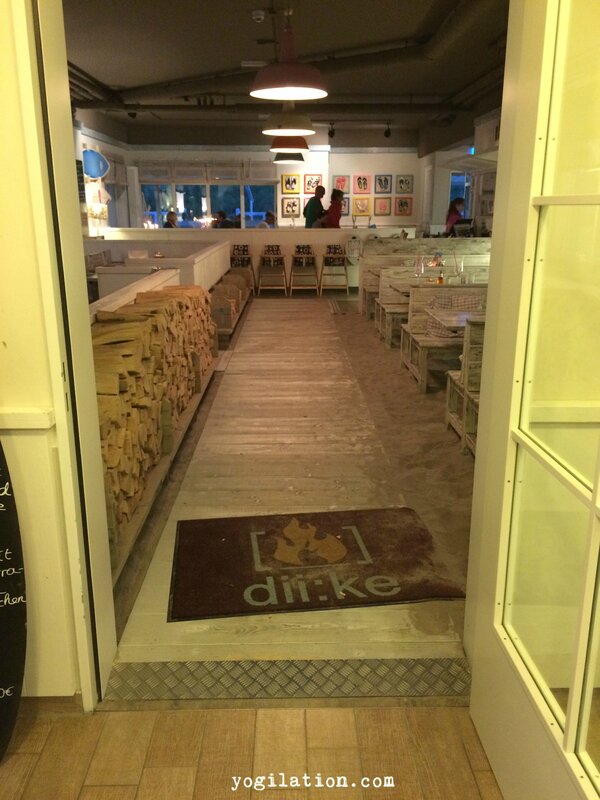 If you’re ever up in St. Peter-Ording, I recommend to check it out. Even if it’s just for a grilled salmon with avocado puree at “Dii:ke” the restaurant of the motel. — YUMM! 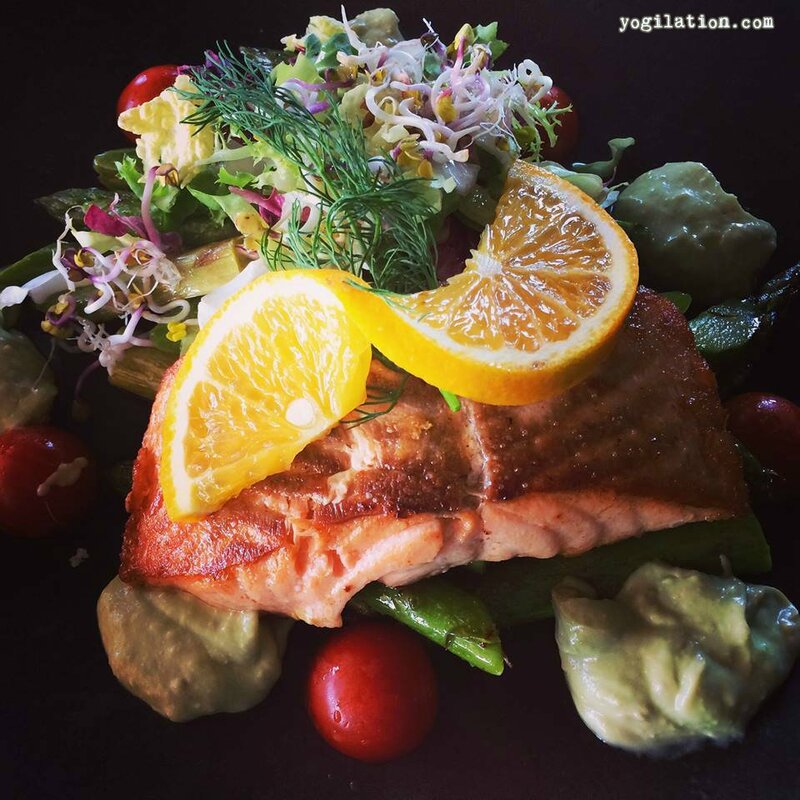 My lunch on Saturday: Grilled salmon with avocado dip , green asparagus and salad. Welcome to your body – Welcome to your emotions! The retreat started on Friday afternoon with a short “hello – who are you” introduction, followed by a 90-minute “Welcome to your Body – Vinyasa Flow” session with Nadine. Suffice to say, we surely got a warm (and sweaty) welcome from our bodies! Thanks to Nadine! I particularly liked Nadine’s instructions throughout the whole class and her words at the end during Shavasana (relaxation after the yoga practice). Very touching, true, and to the point. It really helped me to finally release some of the anxiety and stress from the past months. Our retreat “package” included breakfast and dinner, so we all got together after the evening yoga for a delicious and healthy meal at Dii:ke. A nice and relaxing ending to a first eventful and exciting day. Day 2: 30 minutes mediation and 2x 90-minute of yoga YEHAA! Day two included a 30-minute “Good morning world” meditation practice with Christina and two 90-minute yoga classes, one ” Ego Eradicator – Kundalini-inspired Flow” in the morning (with Christina) and a “Moving Meditation – Yin Yoga” in the late afternoon with Nadine again. The morning meditation was quite an adventure for me, since I usually cannot meditate for more than 10 minutes (max!) and I’ve had my difficulties again, but Christina was great with reminding us that it is okay and to just send those thoughts away or “move them to the side” for now. Meditation surely is something that needs practice and patience, so I celebrate each minute I was able to focus on my breathing instead of my thoughts more. If you find it just as challenging as I am, then please don’t forget to be gentle to yourself, too. You’re not alone! True story: Christina actually asked us the night before not to speak in the morning before we meditate, and just to enjoy the silence and to be with our thoughts in order to get the full benefit out of it. Of course, I forgot (seriously!) about this and saw her early in the morning and started talking to her. She only looked at me and put her finger in front of her mouth (the gesture for keeping quiet) and I apologized and giggled a little because it’s so typical ME. Oh well. Ego Eradicator? Fire breathing? Oh yes! The “Ego-Eradicator” yoga session was interesting. Christina showed us the “fire breathing” technique (have you tried this?) in which we had to keep doing this breathing technique for 3 minutes while keeping our arms and thumbs up to side. Sounds funny? Sure, but it was actually quite effective! Try it! You’ll be energized and feel like a physically and mentally stronger person afterwards. Really good! I liked Christina’s teaching style as well, because she checked in with the group and kept the yoga sequence colorful and diverse. 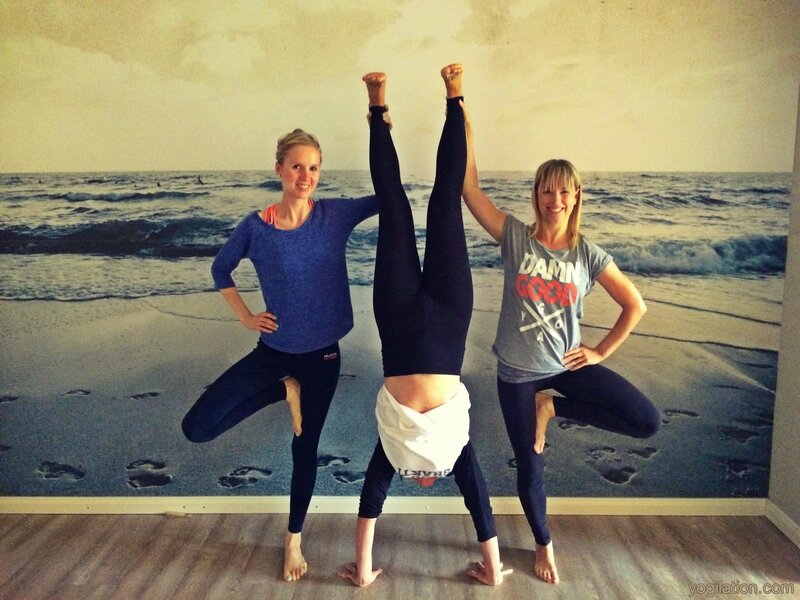 Both, Nadine and Christina were great at keeping the yoga classes exciting, challenging, but also mindful. They constantly reminded us that it’s about US, what WE need and what WE want to get out of the sessions. I truly liked that. If you live in Hamburg, then check out the Damn Good Yoga studio, where both of them teach regularly! The evening Yin yoga class was, IF I’d have to pick one, probably my favorite, because it was the most challenging for me. Okay, just for my new followers or readers who don’t know this about me yet: I cannot sit or hold still for more than maybe a few minutes. I like to be active, to be moving and doing something. And now picture me doing YIN yoga. The kind of yoga which goes deep in your “fascia” and is all about the joints, not the muscles. You know Yin and Yang, right? So, Yin yoga is the opposite of Yang yoga which is the more dynamic and “muscular” yoga practice. 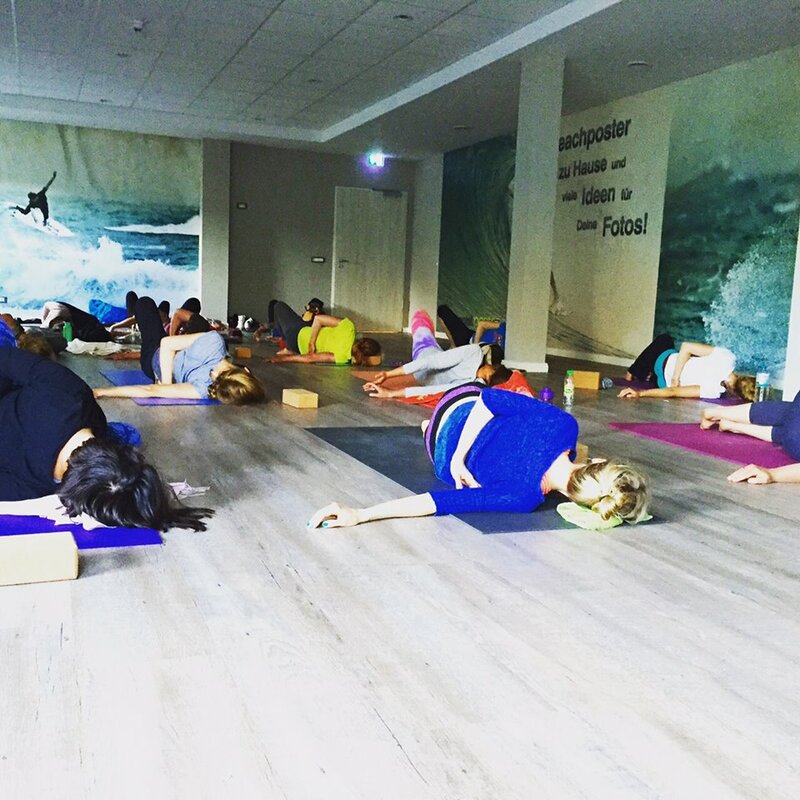 In Yin yoga, you usually hold each position for 3 to 5 minutes (!!) and focus on breathing into the poses. Oh boy did I feel my strained neck and shoulders!! It was painful, literally, but absolutely rewarding and A-mazing! I assure you, if you ever get to try it, you will feel like walking on air afterwards! It’s so relieving and even better than a massage by a physical therapist! Suffice to say: I slept like a baby that night! 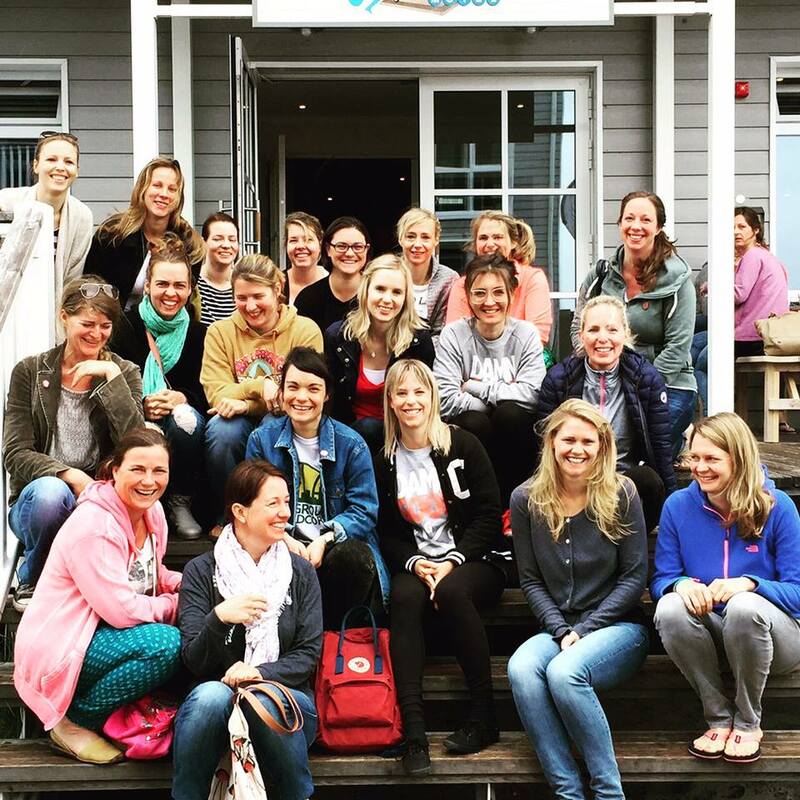 All good things come to an end … and so did this wonderful yoga retreat experience with a “Finally Letting Go – Meditation and Easy Flow” with Christina. A slow but awakening practice, perfect for a mindful and peaceful ending. I still felt soreness from the last two days, probably particularly from the beautifully “painful” Yin Yoga session from the evening before. In sum, the retreat reminded me once again why I started and fell in love with yoga about 8 years ago. Although I went through some serious growing pain like mixed emotions, heart openings, and various small battles with my “inner demons” called self-doubts and self-defeating thoughts those three days, I felt absolutely “Yogilated,” thus inspired, refreshed, relaxed, motivated and energized for new things to come at the end. Furthermore, it helped me listen to my body again. It was a great reminder that yoga is not about what the person next to you is doing, what fancy yoga pose you can do or what a yoga book or teacher said to you in a yoga class before about a pose. IF, for example, a laying side twist feels better to you when you keep your head looking to the side of the legs or up towards the sealing instead of turning your head to the opposite side, then this is totally FINE! Same goes for other twists or any positions during your yoga practice. It’s your body, only you know what feels good today, in this very moment. So trust your feeling and practice the yoga that makes you feel better, not strained or uncomfortable. It’s not a competition. Our body knows exactly what it needs, we just have to learn to let go of this mean little voice in our heads and listen to our bodies again instead. So, next time in your yoga practice, when everyone is doing the full sun salutation and you don’t feel good during Chaturanga or even in the downward facing dog, then just go back into childs pose and stay there. It’s absolutely O-K-A-Y!!! Conclusion: I’ll definitely do a yoga retreat again. Hopefully another one with Christina and Nadine, but next time a little longer than 3 days. Also, I know for sure that I’ll go back to re-visit St. Pter-Ording and this awesome Beach Motel again! Surely worth a visit! Thanks to the two lovely hosts Christina & Nadine for this great experience and yogilational memories!